This fine grinding machine consists of three parts: a main machine, auxiliary machine, and electric control. 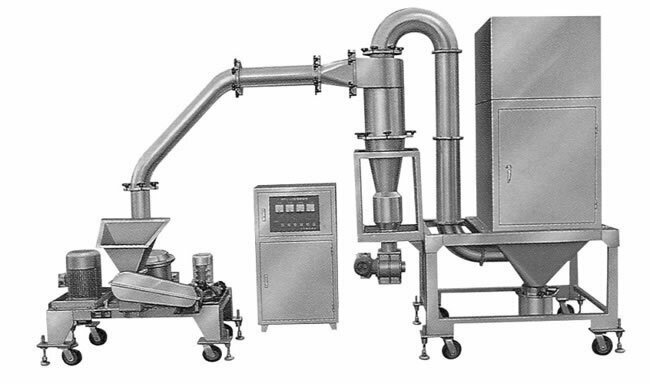 It offers compact design, no screen sieve, size grading, and can accomplish grinding and staging in one step. Since the heat produced from the grinding chamber is exhausted continuously, it also can be used for grinding heat-sensitive materials. The fine grinding machine is widely used for chemicals, foodstuff, medicines, cosmetics, dyestuff, resin, shell materials and so on. We are a specialized fine grinding machine manufacturer in China. In addition to grinding equipment, we also offer drying equipment, sieving equipment, granulation equipment, and mixing equipment.